The code would make illegal efforts to “convert a person or abet him to change his religion” in the southern Asian nation. Specifically, it seeks to prohibit conversion with or without “inducements” and bans preaching “a different religion or faith.” If passed, the code promises steep fines and imprisonment for offenders. Following ten years of civil war, Nepal in 2006 abolished its longstanding monarchy -- with Hinduism as the state religion -- in favor of establishing a federal democratic republic. Currently, the Nepalese government is embroiled in a protracted process of drafting a new constitution expected to guarantee religious freedom, reports indicate. The country’s interim constitution prohibits proselytizing, according to the U.S. State Department’s 2010 International Religious Freedom Report. The wording and intent of the newly proposed code, however, echo Nepal’s constitution during its Hindu monarchy. Then, the country protected citizens’ right to practice religion handed down “from ancient times,” but banned not only proselytism, but also religious conversion, the Religious Freedom World Report said. The report is a publication of the Seventh-day Adventist Church’s department of Public Affairs and Religious Liberty. Having failed to meet their initial May 28 deadline, Nepal’s government is now expected to submit a draft of its new constitution in three months, news reports indicate. “Nepal has a responsibility to protect the freedom of its citizens, including the freedom to have a religion, to have no religion, to change religions and to share and teach religion. This is a basic human right and Nepal cannot build a democratic society while ignoring human rights,” said John Graz, secretary-general of the International Religious Liberty Association. Religious freedom proponents should express their opposition to the code while it’s still a proposal, Graz added. 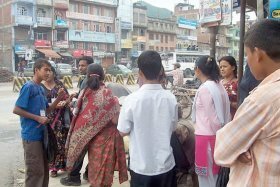 Nepal’s small Christian community, which is not represented in the Hindu majority country’s parliament, was unaware of the proposed code until questioned about it, the Christian Post reported.